Today we see the cheeky, brave and inquisitive little long-tailed Stoat comes and joins us. 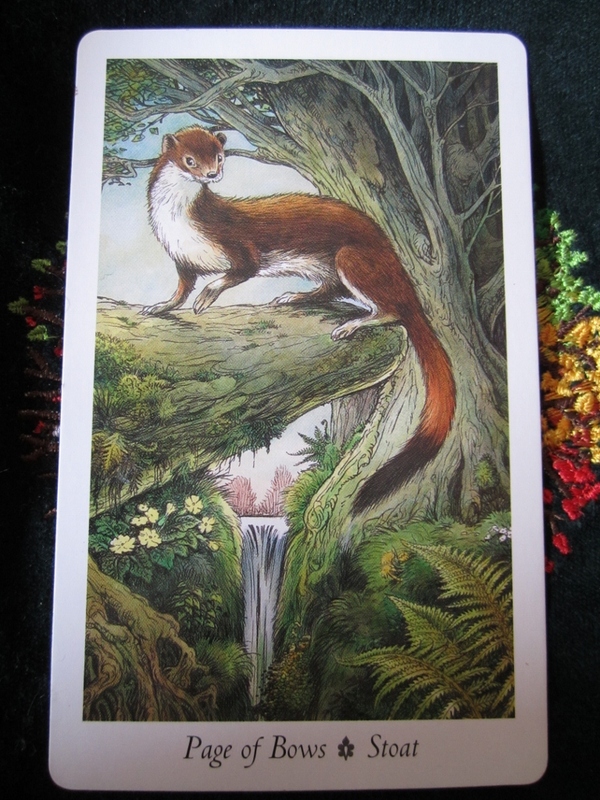 He sits up on a branch, tail down, observing on a rocky ledge while a waterfall in a woodland clearing flows gently by. This stoat can change its fur from it’s red and brown in the summer to the white of winter, forever keeping it’s black tail. These are the three sacred colours of the ancient world and very important. In Shamanic terms, he offers protection and offers truth. He observes who or what needs attention and can offer a solution and assistance discreetly to your situation quietly and discreetly. You can find out more about the stoats, long tailed or short, here. 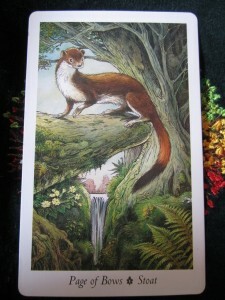 In Wildwood terms, the Stoat appears in late summer on the Wheel of the Year, after Midsommer and towards Lammas. To the Wildwood, he’s an emissary. Having him come up in a reading suggests that your gifts are widely recognised and honoured. Your ability to perceive the truth in almost any matter is vastly helpful. Your free spirit marks you out as an original and unique personality. So, with all that in mind, what message does he have for you today? For me, he’s just given me my “niche”! Thank you Wildwood! !